I have always had a passion for making things, so much so that after completing an art foundation course at my local college, I went on to study Fine Art at Coventry University. After I graduated in 2009 I worked in retail for a couple of years. During that time I took several evening courses, one of which was Silversmithing. I completely fell in love with everything about jewellery making and I've not stopped working on new designs ever since. Because I have a background in Fine Art I approach jewellery differently to other makers and my aim has always been to make original and beautiful wearable art. 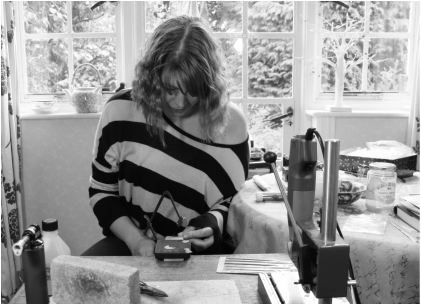 I specialise in creating stunning, contemporary pieces of quality jewellery. A lot of my work is inspired by nature and narratives and living in rural Wales has had a big effect on my work. All of my hand cut figurative pieces are based on nature or contain a narrative of some sort. In more recent years my work has become more abstract and timeless in design. All my jewellery is made using sterling silver as well as occasionally semi precious gemstones and 18ct gold. This means that the finished product is not only beautiful but also lasting. I currently work from my studio at home overlooking my garden. I stock shops and galleries all over Britain as well as selling online on Etsy and Folksy. I can also be found at several craft fairs over the Christmas period. I take commissions so if there's something you would like please don't hesitate to contact me.